Imam Omar Hazim reads from the Quran at the Islamic Center of Topeka, 1115 S.E. 27th. Hazim said Topeka’s Muslim population has grown steadily since the mosque was opened in 1990. More than 20 years after the Islamic Center of Topeka opened, the capital city’s Muslim community continues to grow. Hazim said local Muslims now number about 200 in Topeka, with many of them active in the Islamic Center, 1115 S.E. 27th. In the midst of a scorching summer, Hazim said, Muslims in Topeka are joining other adherents of the Islamic religion around the world as they prepare for the annual Ramadan observance, which starts July 20 and ends Aug. 19. Ramadan includes five “pillars”: fasting from food and drink from dawn to dusk each day; praying five times daily; reading through the Quran; increased acts of charity; and refraining from sensual pleasures from dawn to dusk. Occurring during the ninth month of the Islamic calendar, Ramadan commemorates the time when the Quran, Islam’s holy book, was revealed to the prophet Muhammad. Because it is based on the lunar calendar, Ramadan is observed about 11 days earlier from one year to the next. This year, Ramadan in the United States occurs during one of the hottest stretches of the year, and a time of a great amount of sunlight. As a result, the fasting period each day is several hours longer than it would be in the winter. It takes about 33 years for Ramadan to cycle through an entire 365-day period on the Western calendar. Because of this, Hazim noted, Muslims get to experience “the advantages and disadvantages” of observing Ramadan during the various seasons. Hazim said Muslims must prepare themselves both physically and mentally for the Ramadan fast. Allowances are made in cases where people are elderly, ill, pregnant, nursing or serving in the military. During the Ramadan fast, Hazim said, local Muslims have a greater awareness of people in Topeka and around the world who don’t have enough food to eat. Hazim said efforts are made to provide food for the needy during this time. Local Muslims gather at the Islamic Center at dusk each night of Ramadan for prayers and a communal breaking of the fast. Special iftar dinners are held at the local mosque at sundown on Fridays, Saturdays and Sundays during Ramadan. Community members who aren’t Muslims often are invited to the Islamic Center for the meals. 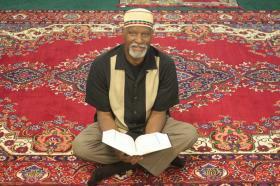 Hazim said through the 22 years of the Islamic Center of Topeka, Muslims have been accepted well in the capital city. Much of that was owed to the Islamic Center’s involvement with Interfaith of Topeka, which Hazim said allowed Muslims to exchange information regarding their beliefs with members of other faith groups. Hazim’s wife, Deidre Hazim, serves as the Islamic Center’s representative to the Interfaith of Topeka board of directors.